That’s quite an eclectic list of solutions, which leads me to ask the following; If those are the solutions, what’s the problem? After all, each solution offers its own distinct benefits. Sitecams – Constant monitoring of jobsite. Remote Access. Provides transparency for the public. Photo Documentation Services – A trained set of eyes behind the camera for improved compliance. Document Management Systems – A secure system for archiving photos taken by the project team. Those are all very desirable benefits that any team would embrace. It seems that each solution attempts to deliver ground level information from the project site. However, they don’t deliver that information in a format that can be immediately evaluated, like data on a spreadsheet. Instead, each solution presents visual media (in the form of digital photos or video), which serve to both store and communicate ground level project information. There is a cost associated with extracting information from visual media so that it can be converted into a usable format. 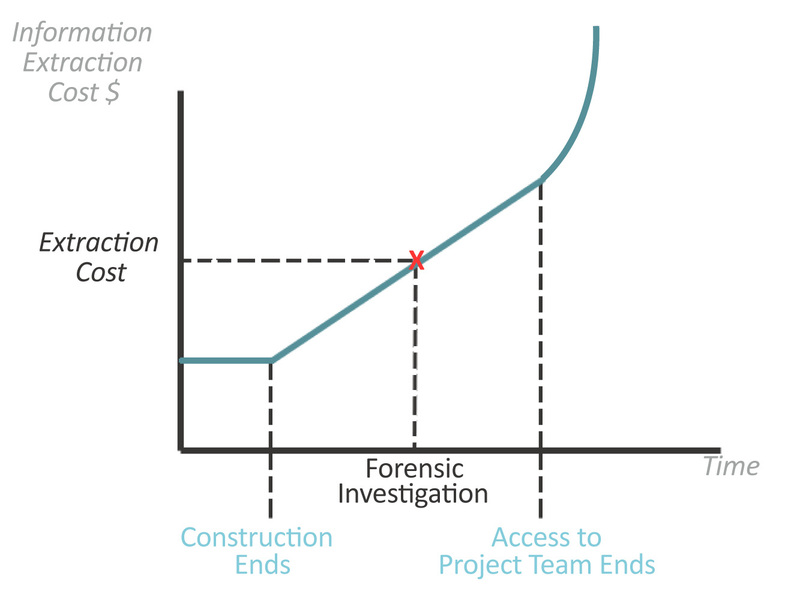 The information extraction cost* is low during construction when the context and subtle details (aka “tribal knowledge”) are fresh in the minds of project team members-see chart below. However, as construction ends, the project team disperses and memories fade, the extraction cost continues to rise until the project’s tribal knowledge evaporates for good. In my next post I will propose an alternative solution for preserving ground level project information indefinitely. *Examples of Information Extraction Costs – time spent searching for media, reviewing media images for relevant information, interviewing project team members for background information, corroborating design data or consulting reports with visual evidence, etc.